Simarjiv Singh Chandok , a student of class XI has represented India and achieved the thirty seventh rank in the U-16 Open Commonwealth Chess Championship 2016, and the thirtieth rank in U-14 Championship 2014. 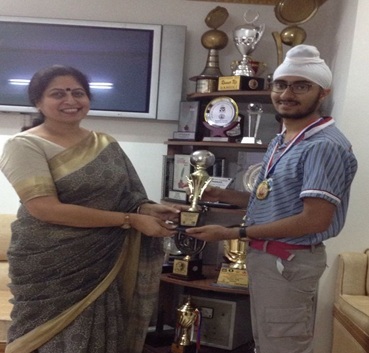 He has completed end number of summer courses through various schools and colleges. He has done Introduction to Economics with Finance 2017, from Delhi Warwick Summer School Course and Marketing Management with International Marketing 2017, from King’s College London India Summer School Course. Apart from this, he is the recipient of the Silver medal in Div. 5 of the Delhi International Football League, 2015-16 and 2016-17. He was the CFO of proposed business venture which won the third rank in TIE Young Entrepreneurs Delhi Business Plan Competition 2015-16. The muse of action also attracted Taekwondo to him. He won the Silver medal in the Singapore Invitational Taekwondo Championship 2011and has been bestowed with the Red Stripe by The Taekwondo Association of India in 2012, the Blue belt in 2011 and the Yellow belt way back in 2008. Besides these achievements, he has been regularly participating in the Inter-School and Inter-House competitions and stolen victory from many a hands. He has also received Scholar Badges and the list is endless….. The above accomplishments only verify for us that hard toil and sincere effort do not go waste. If one has the will to realize his dreams, then nothing can prove to be an obstacle. The winning spree surely continues for Simarjiv……….